For the film adaptation of the book, see Never Let Me Go (2010 film). For the other uses, see Never Let Me Go. ^ "All Time 100 Novels". Time. 16 October 2005. Retrieved 20 May 2010. 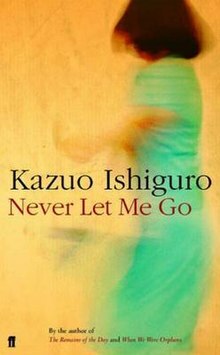 ^ "Never Let Me Go (Programme Site)". Never Let Me Go (Programme Site). TBS.co.jp. Retrieved 29 January 2016. ^ Howell, Peter (30 September 2010). "A quest for the mystery pop singer of Never Let Me Go follows a winding path that leads to Bob Dylan, Atom Egoyan and Guy Maddin". The Toronto Star. ISSN 0319-0781. Retrieved 20 January 2016. ^ Menand, Louis (28 March 2005). "Something About Kathy". New Yorker. New York. Retrieved 26 July 2013. ^ Kerr, Sarah (17 April 2005). "'Never Let Me Go': When They Were Orphans". New York Times. New York. Retrieved 14 March 2011. ^ "Ramsey Campbell interviewed by David McWilliam". Gothic Imagination at the University of Stirling, Scotland. 24 September 2012. Retrieved 29 November 2015. ^ O'Neill, Joseph (May 2005). "Never Let Me Go". The Atlantic. p. 123. Retrieved 14 March 2011. ^ Tait, Theo (13 March 2005). "A sinister harvest". The Telegraph. London. Retrieved 26 July 2013. ^ "Never let Me Go Cast (in Japanese)". Never Let Me Go (Programme Site). TBS.co.jp. Retrieved 29 January 2016. This page was last edited on 29 March 2019, at 07:31 (UTC).